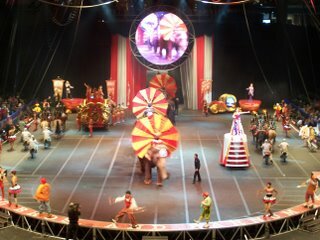 A few weeks ago we went to the circus. And then I just sort of forgot that we ever went (or more accurately got bored at the thought of writing a post about it and then having someone tell me I'm an evil animal killer because we went to the circus and every year there are people there protesting and trying to hand my kids pictures of dead animals so ick). I think I would have been perfectly happy to just keep on forgetting, because as much fun as sitting in horribly uncomfortable seats, eating super salty ice cold popcorn and trying to not go blind from all of the flashing lights is, blocking out that memory makes it possible for me to go again the next year when 'Girl' starts begging again (and I know, geez already. What happened to coming out of the blogging closet? But I will get to that. eventually. Probably). I had a really good lead on the forgetting until Hurricane found the pictures from that day and decided to teach me a lesson. Or at least that's what I think he was trying to do. 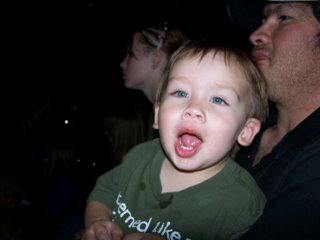 It's hard to say for sure since he was yelling at me and apparently very angry about the elephants. His face got red, his lips pouting. "NO MAMA! Un, two, tree NELEFUNNNN!" "Un, two, tree NELEFUNNN! Nawny Mama." "I don't know what Daddy has been telling you but I am not naughty." He pointed to the picture again. Did he actually count that? Or is this just one of those non-sensical things that would probably make sense if I spoke the language? "How many ears does mommy have?" "Yes, that's my nose. Could you please take your finger out of it?" "I don't have any elephants. They don't make good pets." "Their shaped likes cats but close enough." I handed him un, two, tree cat cookies. He set them side by side on the table and looked at them quietly. Yeah. Everything is perfectly normal. *Yes, that is your first really bad glimpse of Mr X, otherwise known as Joe, or the guy that still does the robot, or the guy who is a really good sport when I sew the leg of his underwear shut solely for my amusement. Hee! Love that ice cold salty popcorn. Best with luke warm Sprite. I'd go to the circus just for that alone. Not really. I'm just saying that. Joe looks so happy to be at the circus. In other news, for some reason yahoo emails get kicked back to me sometimes, so I sent you a second one on pimento cheese so that you might get on with your life because it's just that important.